Stroll back through the centuries. 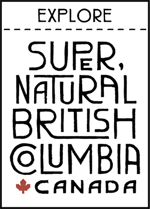 Victoria’s rich history is on full display in many downtown alleys, squares and important landmarks. 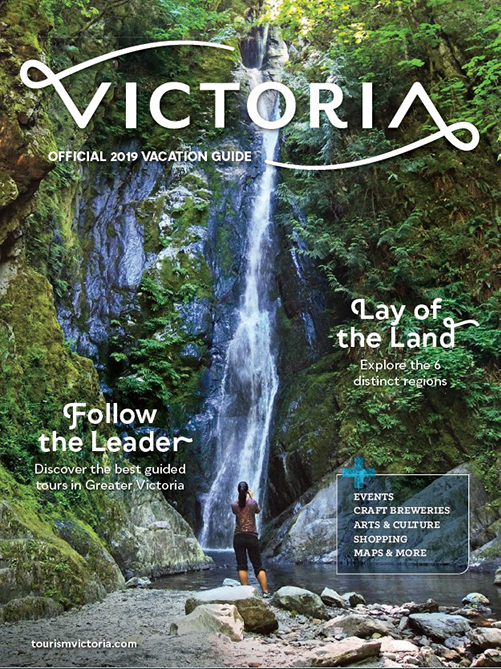 They’re all well preserved and add a unique and distinguished sense of enchantment to Victoria’s modern, vibrant character. 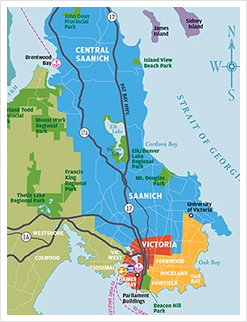 Part of the original Fort Victoria, find some of Victoria’s finest restaurants, pubs and cafés (and some of the sunniest patios) in Bastion Square. The area is also part of a bustling outdoor summer market. The Court House (designed by architect H.O. Tiedeman) was the first concrete building in Victoria, built in 1889. The Law Chambers, designed by F.M. Rattenbury, was built in the late 1800s. Burnes House, originally a hotel in 1882 (then a brothel and later a warehouse) was restored in 1967. Strousse Warehouse was built in 1885 as a supply centre for gold miners. The Board of Trade building was built in 1892 by A.M. Muir. Be sure to pass through Helmcken Alley for a more sordid look at the square’s past. Once a jailhouse where executions took place and a graveyard for unclaimed bodies of prisoners, it is said to still be haunted since the prison’s demolition in 1885. Centennial Square was built in 1962 to mark the 100th anniversary of Victoria’s incorporation. It includes City Hall, the McPherson Playhouse, a senior citizens’ activity centre, Capital Regional District services, a parkade, shops and a giant sequoia tree. Within Centennial Square is also Spirit Square, a public gathering space surrounded by trees and native flora that was designed to encourage Victoria’s arts and cultural community. The space features a water fountain, two large spirit (totem) poles known as the “two brothers” and five life-size orca models. The square is often host to many music and dance performances, markets and festivals during the summer, and a festive light display with over 75,000 LED lights in the winter. Formerly part of Olde Towne Victoria, Market Square boasts three levels of independent shops and restaurants. An assortment of eclectic arts and exciting cultural activities take place year-round. Instead of shops and restaurants, this square next to Christ Church Cathedral is actually a cemetery—Victoria’s second oldest—that was established and used between 1858 and 1873. Many distinguished pioneers are buried here. Found in one of the oldest surviving Chinatowns on the continent, this alley is also the narrowest commercial street in North America—just 0.9 metres (less than 3ft) wide at its narrowest. Originally a gambling district, you’ll now find a variety of interesting shops, restaurants and galleries. Just across the street from Fan Tan Alley on Fisgard St. is Dragon Alley. Sharing a similar history and feel to Fan Tan Alley, but with a slightly more modern and Zen atmosphere, the large dragon sign hanging at the entrance is your cue to explore. While walking through the alley, red and yellow lights line the ceiling of the narrow corridor leading you into a wider area with a coffee shop, an emporium, and other unique shops. 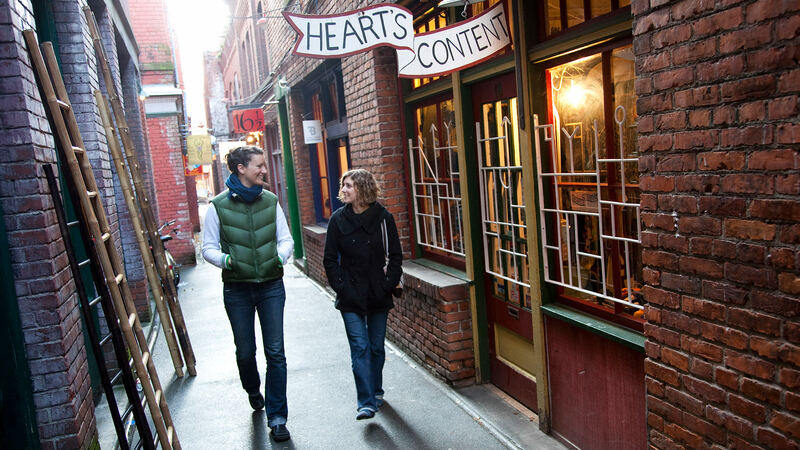 Named after Victoria Pioneer Thomas Trounce, Trounce Alley contains authentic gaslights that are over 125 years old. 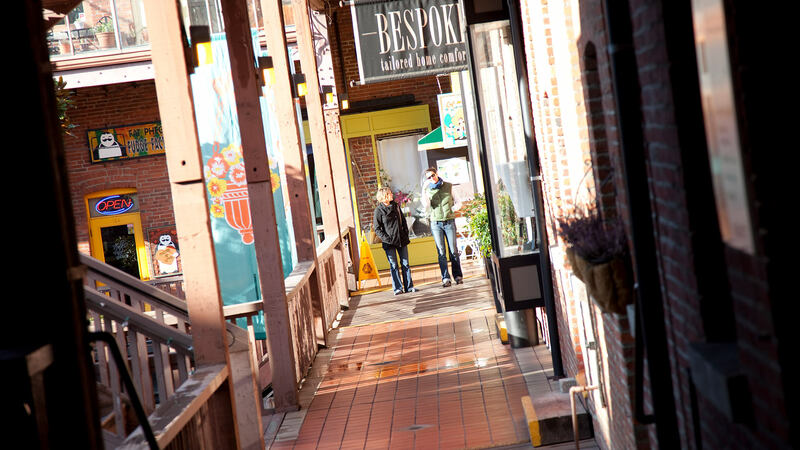 Trounce Alley is also home to one-of-a-kind shops and authentic Spanish style tapa bars. 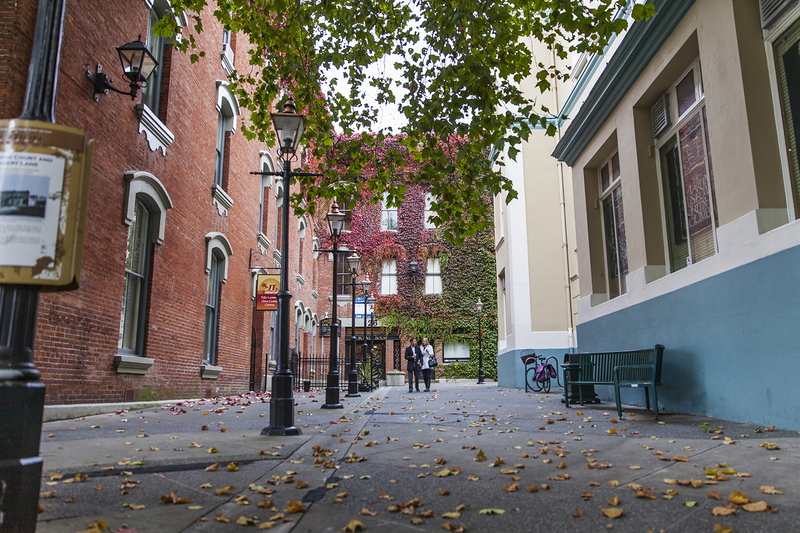 As the last “wooden street” in Victoria, the origin of this alleyway belongs to Alfred Waddington, a local gold rush entrepreneur and businessman who first built the alley in 1858. While one could at first pass the alley mistaking it only for a shortcut between Yates and Johnson Streets, they would be missing out on one of the closest experiences to reliving the streets of Victoria at the turn of the century. 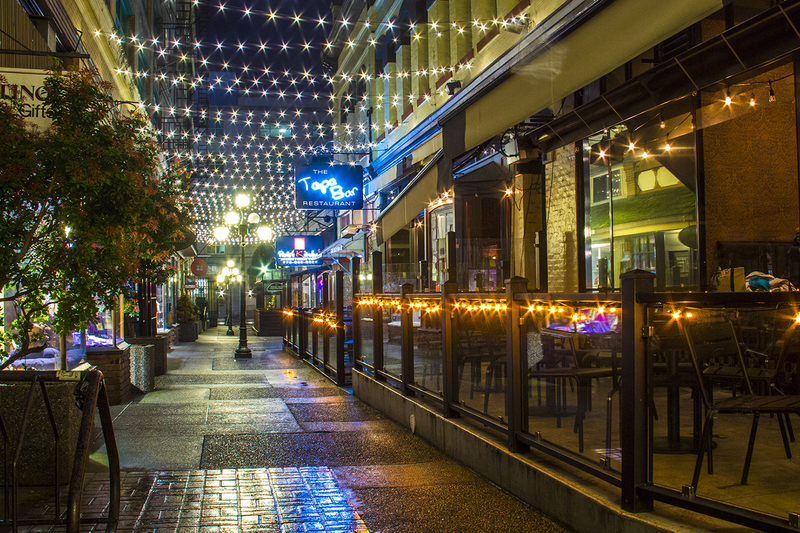 A road paved with creosoted wooden bricks made of old-growth Douglas Fir, a rare metal carriage curb, and century-old heritage buildings including a delicious bakery and candlelit Italian restaurant, are what make this alley worth the stroll.